As we enter into warmer weather, we seem to think about fitting into our summer clothes that usually expose our arms, backs, legs and midriffs. Not always a pleasant thought for many of us who have hibernated during the winter months and added on a little extra padding! Salads are the foods that come first to mind when we think of trimming the excess fat. But not all salads are created equally. We can't imagine that all those healthy vegetables, some protein and dressing could be a nutritional disaster. The innocent greens and grilled chicken are not the problem. The dressings or the "crispy" chicken or other fried proteins seem to be the source of all evil! First of all, we tend to love our salads saturated with dressings that contain excess oil, mayonnaise or cheese. 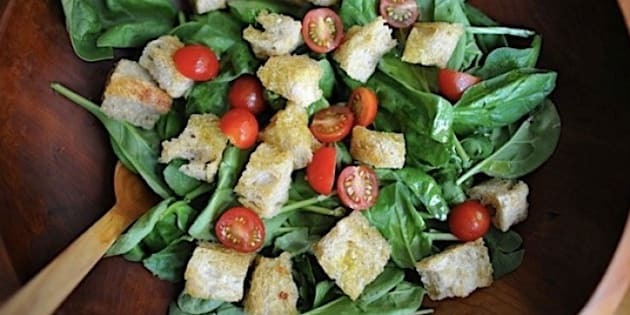 Another name for Caesar Salad might be "Heart Attack on a Plate!" as the dressing can sometimes be high in fat. But with a little nutrition 101 you can enjoy a salad the way it was meant to be, a healthy "event." Enjoy fresh, locally grown produce as part of your main meal or side dish and add vegetables, fruit, lean protein and whole grains to enhance a salad, which all add more nutrients and keep you satisfied. Go to your supermarket and see the endless variations with bright colours, textures and flavours. Forget the iceberg lettuce and go with baby spinach, arugula, mesclun, radicchio, endive or a combination. For the freshest produce, source out a local farmer. If affordable, I always suggest buying organic greens. To make your next salad unique I love to grill my vegetables as opposed to using raw. Grilled coloured bell peppers, zucchini and eggplant, onions, tomatoes, mushrooms and corn are an exceptional addition to any salad. Try baby cucumber, grape tomatoes, beets, fennel or jicama for added flavour and texture. We often don't think of adding fruit to a salad. Fresh fruits add another dimension to salads. Try adding blueberries, strawberries, blackberries, mango, papaya, orange segments, avocado and fresh dates, figs or lychees to your next salad. Dried fruits such as apricots, cranberries, raisins and dates add another flavour and texture as well. So now that you have the basis of an outstanding salad, what do you do about the high-fat, delicious dressings that create nutritional havoc? The traditional dressing has three parts oil to one part vinegar, which is where all the fat and calories come to play. Instead, replace about half the oil with orange juice, apple juice or pineapple juice concentrate, maple syrup, hoisin sauce, light coconut milk or light mayonnaise or sour cream. Also try using more flavoured oil rather than just vegetable oil. Try olive, sesame or walnut oil which allows you to use smaller amounts than a regular vegetable oil. Traditional pasta or coleslaws are usually drowning in either mayonnaise, oil or pestos. Cut back on the dressings in these salads and always use a light mayonnaise or smaller amount of flavoured oils. If you're adding grains, always go for the whole grain variety, such as wild or brown rice, wheatberry, millet and the most popular of all, quinoa. If a salad is my main course I always have some protein added to ensure that I'm filled. My favourites include about 4 oz of grilled flank steak, tenderloin, fish and seafood or tofu. If you're vegetarian, simply add beans and a grain together and you have a complete protein. You'll never look at a salad the same way again!